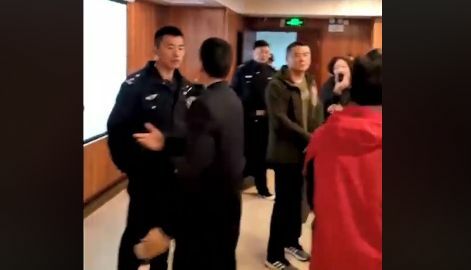 XUZHOU, Jiangsu — A video posted to social media shows Chinese authorities interrupting a church gathering and members trying to reason with police. The incident occurred on Nov. 18 in Xuzhou at an assembly simply known as Xuzhou Church. The short video clip shows a woman singing at a podium while police stand just feet from her. Church members speak to the officers, and while their words cannot be heard in the footage, it is understood that they are diligently contending with the police. “The police came into a church this morning and because they were Christian, the people were told to end the service and go home or face arrest. This is China,” wrote Christopher Gregory of the organization China Missions, who shared the footage. According to the organization China Aid, churches in China who wish to gather for worship must register with the Three-Self Patriotic Movement, the only officially authorized Protestant Church in China, and even then, they are only allowed to hold gatherings in buildings that are operated by the government. “Because most of these churches are instructed to teach loyalty to the Communist Party and the Chinese State and often teach propaganda over the actual tenets of these faiths, many faithful religious adherents choose to meet outside of the official religious system, in groups known as house churches or underground churches,” China Aid explains. However, it is illegal to operate a church outside of registering with the Three-Self Movement, and those that do so are often subject to detainment, arrest or imprisonment. Enforcement varies from province to province. Many churches have also been raided by government officials and/or the crosses have been torn down from their buildings. Some have been placed under government surveillance or shut out of their buildings altogether. The video has been viewed 12K times as of press time.